This game is really only a continuation of the "Turtle," but I have made it a separate figure, provisionally, because I saw the Philippine Linao Moros at the St. Louis Exposition form it from another figure which I could not record, but I think it was the same as "Bagobo Diamonds." Subsequently I learned the figure, as a part of the "Turtle," from Dr. Furness, who collected it in the Caroline Islands from the Uap girl "Dakofel." 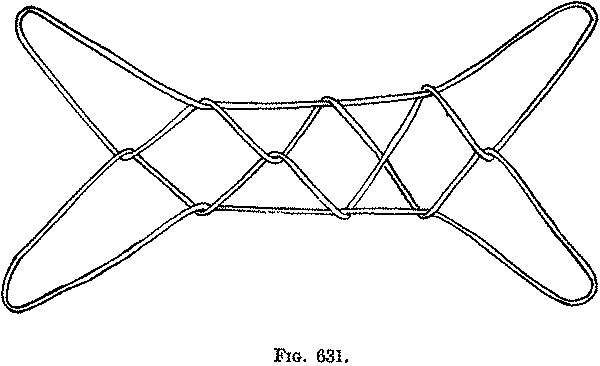 Two persons are required for this figure, which is formed from the completed figure of either the Caroline Islands "Turtle" or the "Bagobo Small Diamonds," preferably from the "Turtle," as the strings are not so much twisted about the fingers. First: The first person holds the completed figure of the "Turtle" in front of him, vertically of course, and the second person faces him. The figure consists of a central row of three lozenges and two side rows of four triangles each. These triangles may be numbered first, second, third and fourth from below upward, and the rows are right and left as seen by the second person. The second person directs his left little finger away from him through the first (lower) left triangle, and his right little finger away from him through the first right triangle. Keeping the little fingers in these triangles, he now directs the thumbs away from him through the second side triangles, the right thumb of course through the right triangle, the left thumb through the left triangle. 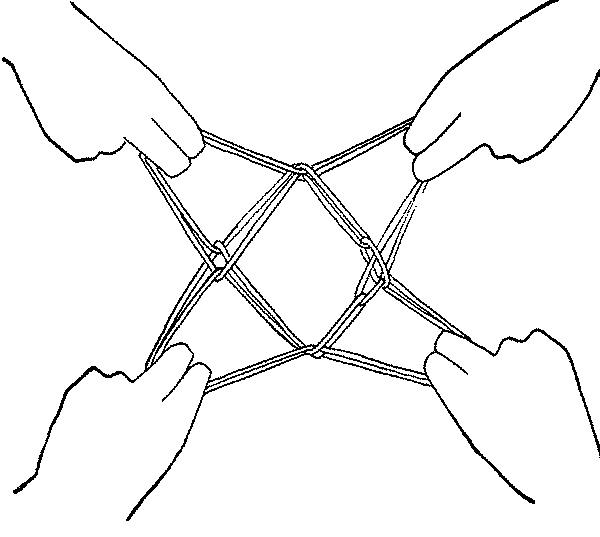 Turning each thumb up he directs it toward him through the third triangle (Fig. 626). The first person now places his right little finger loop, untwisted, on the left little finger of the second person, and his right index loop, untwisted, on the right little finger of the second person (Fig. 627), and withdraws his hands entirely from the figure. 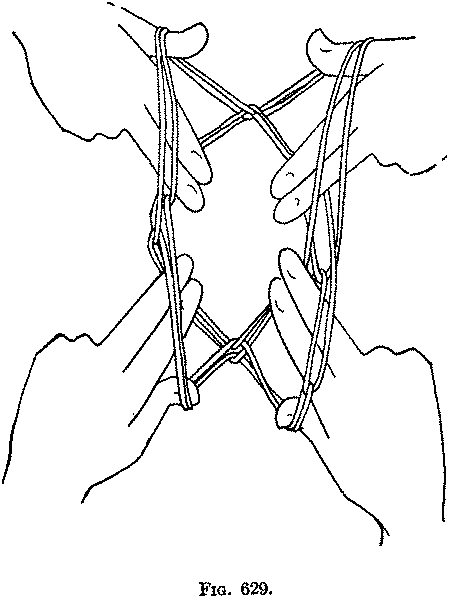 The second person now puts his hands in the usual position and draws the strings tight. He has two loops on each thumb and two loops on each little finger. Second: The first person now puts his right thumb from below into the left thumb loops of the second person, and his left thumb from below into the left little finger loops of the second person, and takes these loops away from the second person on his thumbs. The second person puts his left thumb from below into the loops which are on his right thumb, and removes the right thumb, and puts his right thumb from below into the loops which are on his right little finger, and removes the right little finger. The figure is now drawn tight on the four thumbs (Fig. 628). It consists of a central lozenge, the sides of which form the bases of the triangles held by the thumbs. 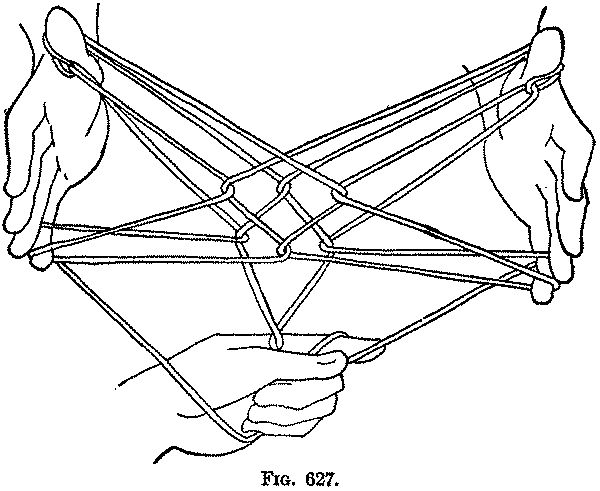 Third: Each person now puts the index and middle finger of each hand, from below, into the triangle extended by the thumb, and then away from him over the strings forming the base of this triangle (the corresponding side of the central lozenge) (Fig. 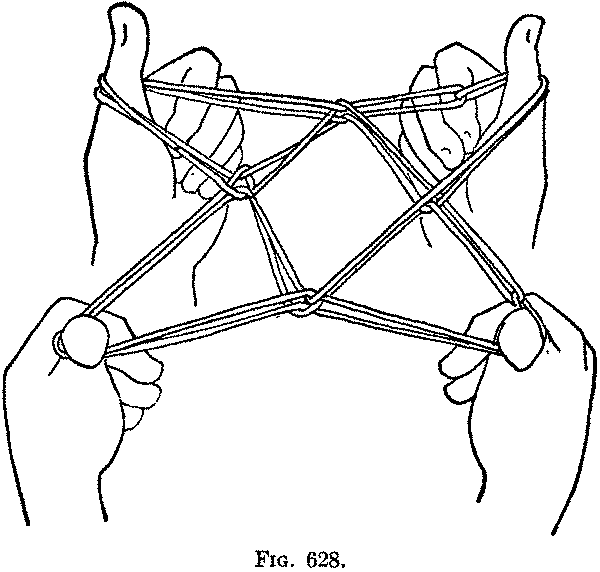 629), and pulls these strings down and toward him, letting the loops slip off the thumb (Fig. 630). Each person now puts each thumb from below into the loop held by the index and middle finger and withdraws these fingers. Fourth: Repeat the Third movement nine times. Fifth: The figure is now laid down, and all the fingers are withdrawn. If you are careful, the top half of the figure can now be lifted up and opened out like a book, when it will be seen that you have again the original "Turtle" figure (Fig. 631), from which these movements can be again repeated. The Moros, who showed me this figure, appeared to take great delight in doing it; and they were much surprised to see Dr. Furness form it from the "Turtle." They always repeated the Third movement nineteen times, so we might more properly call the figure "Twenty Times" but in the Caroline Islands it is universally done ten times. As a matter of fact the figure will succeed if the movement be done any even number of times.